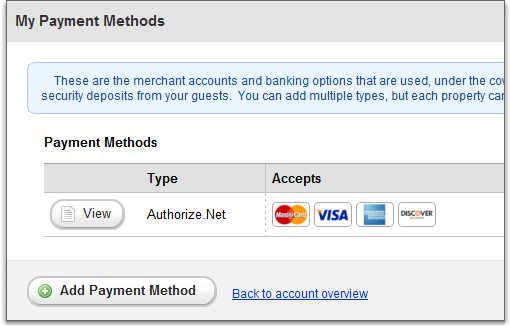 In the last post, we mentioned that OwnerRez now supports multiple payment methods per account. Let's take a look at the details. Go to the Account menu and look at the Payment Methods box on the bottom right. You'll see a description of the payment method you're currently using as well as some options to view all payment methods and add more. 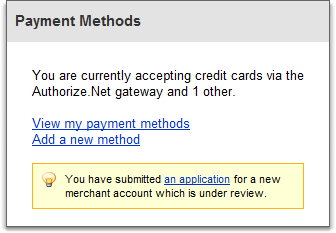 If you've recently filled out a merchant account application, you'll see that too. Click the 'View my payment methods' link and you'll see a new page showing a grid of your methods. If this is the first time you're seeing this area, your account will only show one payment method since that's all you could use before. Click the 'Add Payment Method' button to see a list of the possible payment methods you can add to your account. In addition to a new design, you'll notice that there are now two extra payment methods showing - Sage Payments and manual checks. 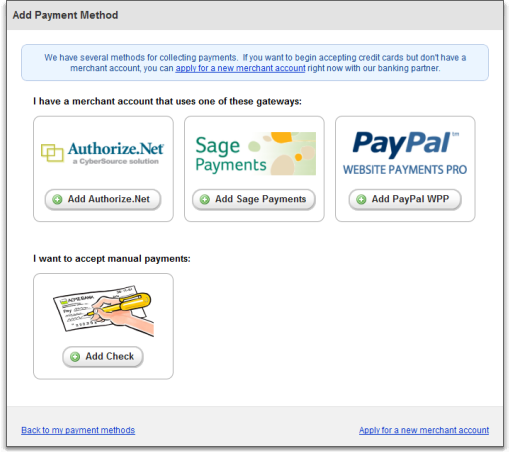 Sage Payments is a provider of merchant accounts, and they operate their own internet gateway. In layman's terms, that means that they do online credit card processing. If you use our application to create a new merchant account, you'll end up using Sage Payments as the gateway. And now, anyone with a Sage Payments account, no matter where it was created, can hook it up to their OwnerRez account in just a few quick seconds. The other new payment method - manual checks - is where we spent a good hunk of development time over the past few months. A lot of users told us that they wanted their guests to be able to accept a quote yet send payments by mail. This created ramifications throughout the app, and we'll explore those issues in the next few days. For now, I want to continue discussing payment methods in the abstract. Pull up an open quote and click on the Payment Form tab. 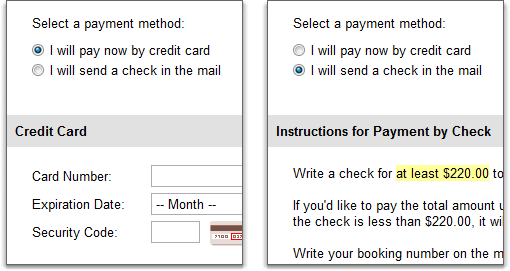 As you'll see, the payment form looks updated - different text, different buttons, cleaner mid-section. Notice at the bottom that it shows the guest how they can pay in clear, cold language. If you have both a credit card and check payment method added to the property, it'll show both as payment options. If you click through the next legal page and continue to the billing page, you'll notice that the guest is presented with both payment methods and can select the one he wants. As I mentioned previously, there are ramifications if the guests pays by check because a check may never show up. I'll discuss those ramifications in the next few days. If you're curious now, take a peek at the Pending State fields under the General Info tab of a booking. In the coming months, we'll be adding PayPal and Google Wallet (formerly called Google Checkout) as payment methods, and you'll be able to add those to your properties as well. We already support PayPal's Payments Pro gateway, but we'll be adding support for regular PayPal where the guest will be directed to PayPal's website to pay privately. We're also working on credit card integration for FirstData and Stripe. If there's a payment method you'd like to see added, please let us know. Because of the work we've done over the past several months, it is now much easier to plug in support for new payment methods, and we look forward to doing just that. I have both check and Paypal set up but when i go in to test a booking from my website i am only given the option for check. I cant figure this out. It looks like you've got booking confirmation enabled in the property Rules section. That turns on a mode where the credit card is stored when the guest checks out, but not processed until you approve the booking. Unfortunately, booking confirmation doesn't work with PayPal because we don't get a credit card back from PayPal to verify, just a payment approval -- that's why it's not showing up at checkout. Go to the property rules for each property and switch Online Bookings back to "Confirmation not required (recommended)" and you'll see PayPal show up on checkout.